If you're looking for a great (and cheap!) hotel in St. Louis, CheapTickets is the best place to find them. 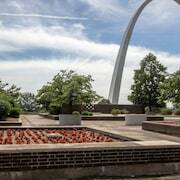 We offer deals on the best 273 hotels throughout St. Louis. No matter what you're looking for, we have options for you. Grab great rates on the 101 affordable 3-star hotels that are easy on the wallet without sacrificing comfort. Looking for more luxury? Try one of the 20, 4-star hotel accommodations in St. Louis. No matter your budget needs, we've pulled out all the stops to make sure you have plenty of vacation options. Maybe you prefer to search for your hotel deals based on what each hotel offers? For example, let's say you just want to find a hotel or resort that has a pool to cool off in after a long day exploring St. Louis. Scroll down to choose from the 210 hotels in St. Louis that has a pool for guests. Or search for deals on St. Louis hotels offering free wifi or breakfast, non-smoking rooms, and more! CheapTickets is here to be your personal travel agent for your next trip to St. Louis. Get booking today! What hotels in St. Louis offer free wifi access? Are there deals on St. Louis hotels offering free breakfast? Yes! The only thing better than finding a great deal on a cheap hotel in St. Louis is finding one that offers free breakfast. Grab some eggs, a waffle, or some healthy oatmeal before a day full of exploring St. Louis and all that it has to offer. Below are just some of the many hotels that offer free breakfast in St. Louis. 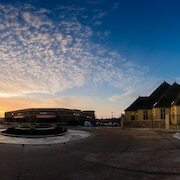 Hyatt Place St. Louis/Chesterfield is a 3.00 star rated hotel property in St. Louis that offers free breakfast. Marriott St. Louis Airport is a 3.50 star rated hotel property in St. Louis that offers free breakfast. Magnolia Hotel St. Louis- a Tribute Portfolio Hotel is a 4.00 star rated hotel property in St. Louis that offers free breakfast. Hyatt Regency St. Louis at The Arch is a 4.00 star rated hotel property in St. Louis that offers free breakfast. What about deals on pet-friendly hotels in St. Louis? St. Louis is a great place to get outside and explore with your pets in tow so don't leave your furry friends behind. Below you'll find great deals on hotels in St. Louis that allow pets. Don't forget to bring plenty of treats! Red Roof Inn St Louis - Westport is a popular, pet-friendly, 2.00 star hotel in St. Louis. The Wildwood Hotel is a popular, pet-friendly, 3.50 star hotel in St. Louis. Hilton St. Louis Airport is a popular, pet-friendly, 3.50 star hotel in St. Louis. The Parkway Hotel is a popular, pet-friendly, 3.00 star hotel in St. Louis. Any good rates on St. Louis hotels with restaurants? Absolutely. Don't want to deal with planning our all your meals on your trip to St. Louis? We don't blame you. Keep the hangry away by staying in one of the 79 hotels that have restaurants. With a room at one of these spots, all it takes to get a good meal is hopping in the elevator. Check out some of the most popular hotels in St. Louis that have restaurants below. Book Moonrise HotelMoonrise Hotel is a 4.00 star hotel and has one or more restaurant options. Book Clayton Plaza HotelClayton Plaza Hotel is a 3.50 star hotel and has one or more restaurant options. Book The CheshireThe Cheshire is a 4.00 star hotel and has one or more restaurant options. 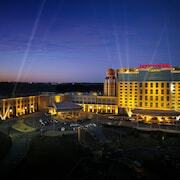 Book Ameristar Casino Resort and SpaAmeristar Casino Resort and Spa is a 4.50 star hotel and has one or more restaurant options. What are the cheapest hotels in St. Louis with pools? 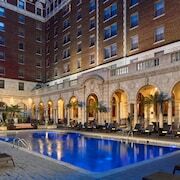 What's better after a long day exploring St. Louis then a relaxing dip in a pool? Finding the St. Louis hotel you need for a bargain! Cool off and unwind at one of our 210 St. Louis hotels with a pool. Browse some of the top deals on these hotels and resorts with pools in St. Louis below, but be warned: You may not want to check out! Embassy Suites St. Louis - Airport has a pool and a 3.50 star rating. HoteLumiere at the Arch has a pool and a 4.00 star rating. 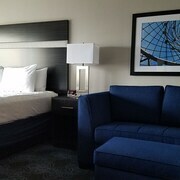 Residence Inn by Marriott St. Louis Galleria has a pool and a 3.00 star rating. Days Inn by Wyndham St. Louis/Westport MO has a pool and a 2.50 star rating. What hotels in St. Louis offer parking for guests? Once you've made your way to St. Louis, the last thing you want to deal with is finding parking close to your hotel. Avoid the hassle of parking around the block and carrying your luggage all the way to the lobby by booking one of our hotels with parking. Check out deals on some of the 222 hotels in St. Louis that offer parking for guests. Best Western Plus The Charles Hotel This hotel has a 2.50-star rating. Drury Inn Airport - St. Louis- MO This hotel has a 3.00-star rating. River City Casino & Hotel This hotel has a 4.00-star rating. Kaiser Hotel This hotel has a 2.50-star rating. Do St. Louis hotels offer 24-hour concierge services? When you're on vacation, things don't always go according to plan. Travel with peace of mind when you book one of our 32 hotels in St. Louis with 24-hour concierge service. That way you know help is always phone call or elevator ride away. Try The Chase Park Plaza Royal Sonesta St. Louis. It's a 4.50 star rated hotel in St. Louis that offers concierge services 24 hours a day. Try Renaissance St. Louis Airport Hotel. It's a 4.00 star rated hotel in St. Louis that offers concierge services 24 hours a day. 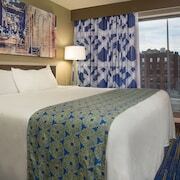 Try St. Louis Union Station Hotel- Curio Collection by Hilton. It's a 4.00 star rated hotel in St. Louis that offers concierge services 24 hours a day. Try Crowne Plaza St. Louis Airport. It's a 3.50 star rated hotel in St. Louis that offers concierge services 24 hours a day. What about low rates on non-smoking hotels in St. Louis? Hollywood Casino & Hotel St. Louis This hotel has a 3.50-star rating. Motel 6 St Louis East-Caseyville This hotel has a 2.00-star rating. La Quinta Inn St. Louis Hazelwood - Airport North This hotel has a 2.50-star rating. What are the cheapest St. Louis 3-star hotel deals? Our 3-star hotels bring you quality accommodations at a lower price point for the perfect, budget-friendly vacation in St. Louis. With 101 3-star hotels throughout St. Louis to choose from, you still have options. Browse our selection below. Hollywood Casino & Hotel St. Louis. Situated near the airport, this hotel is 1.4 mi (2.3 km) from Hollywood Casino Amphitheatre and within 6 mi (10 km) of Historic Aircraft Restoration Museum and Lewis & Clark Boathouse and Nature Center. Payne-Gentry Historical House and First Missouri State Capitol Historic Site are also within 6 mi (10 km). Marriott St. Louis Airport. Located 3 miles from Verizon Wireless Amphitheater, Marriott St. Louis Airport is off I-70, which provides easy access to major arterials; across the freeway is the St. Louis airport and a mass-transit rail station. Red Lion Hotel St Louis City Center. This historic 13-story St. Louis hotel is 1 block from Scottrade/Peabody Opera House Complex, 3 blocks from Union Station, and 5 blocks from Busch Stadium. The Gateway Arch is 1 mile away. Holiday Inn St. Louis West Six Flags. Situated in Eureka, this hotel is within a 15-minute walk of Six Flags St. Louis and Hurricane Harbor. Winding Brook Estates Lavender Farm is 2.4 mi (3.9 km) away. What are the best deals on 4-Star Hotels in St. Louis? St. Louis is full of hotels and it can be hard to narrow down where you really want to stay. Luckily, we've done that hard work for you be narrowing you from 273 hotels throughout St. Louis, to the 20 4-star hotels in St. Louis. Our 4-star hotels in St. Louis are exactly what you need for your next family trip, romantic weekend, or solo getaway. Check out our most popular deals below. Hyatt Regency St. Louis at The Arch: This 18-story Hyatt Regency hotel is 4 blocks from Busch Stadium and within a mile of Edward Jones Dome, Scottrade Center, Laclede's Landing, and the America's Center. 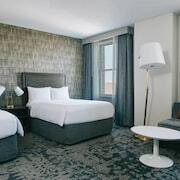 HoteLumiere at the Arch: This downtown St. Louis hotel connects to Lumiere Place Casino; Laclede's Landing and the Edward Jones Dome are 3 blocks away. The Chase Park Plaza Royal Sonesta St. Louis: Located in the fashionable Central West End of St. Louis and close to Washington University and St. Louis University, this hotel is surrounded by shops, restaurants, mansions, and Forest Park. It's also 4 blocks from Barnes Hospital and 1 mile from museums and the zoo. River City Casino & Hotel: Situated on the riverwalk, this hotel is within 3 mi (5 km) of Jefferson Barracks Historic Park, Missouri Civil War Museum, and Sister Marie Charles Park. Bellerive Park is 3.1 mi (4.9 km) away. What are the best activities to do in St. Louis? Adventure Valley 10-Zipline Canopy Tour: Starting at just $75 per person. Paintball Park: Starting at just $43 per person. Scenic Hot Air Balloon Ride: Starting at just $219 per person. Dining at Hard Rock Cafe St. Louis with Priority Seating: Starting at just $35 per person. Everyone was very helpful and the room was very clean. The bed was so soft and comfortable. Pillows were awesome. I wanted to sleep way past check out!! Light-blocking shades made it easier to sleep. The pick-up from the airport was quick. Nice hotel located close to all the fun things to do in the city. The description of the room said 2 bedrooms, however when we got to the hotel we very disappointed to find that wasn't the case. It was 1 bedroom with 2 beds and a living room. The hotel staff understood our frustration and ended up giving us 2 rooms at a discount. They blamed the third party for the issue and said their website doesn't advertise their rooms that way.